Studies have shown that babies with plagiocephaly are kind, sweet, loving, and happy infants. Our research has determined a correlation between a cranial flat spot and a jovial affect. First, I must give you a little background on our two test monkeys subjects. Smushie, the present subject, is all of those pleasant things and the posterior portion of her head is flat. And a number of years ago, I (the other subject) was a baby with similar features, both of personality and of physique. Coincidence? No. These two positive data points makes us (and by us, I mean me) confident that my our assumption holds 100% true. 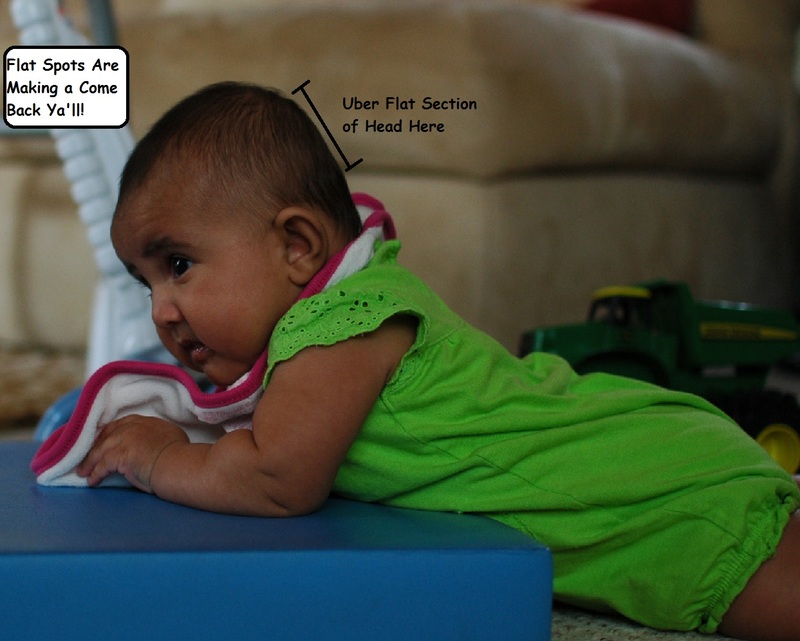 Babies with flat heads are definitely more good-natured than their round-headed counterparts. Now back to the Smushster. Her head is flat in the back. Not so much now as it was before, since she’s been a stomach sleeper for the past 2 months. I know, I know. SIDS risk, right? But, I can’t force her to sleep on her back without duct taping her pj’s to the mattress and the wife nixed that idea pretty quickly. (She quickly nixes most of my ideas, huh?) Because of the fear of SIDS that my wife instilled in me, I now sleep in the same room as Smush. I keep one ear peeled and pounce on any funny noises exiting her crib. Anyhow, for the first 4 months of her life, she was always on her back. Why? Because we read somewhere that you should never try to make a happy baby even happier. So, we didn’t. It would have been foolish of me to bother to pick Smush up while she was being such a good little girl. And boy, oh boy, has she been a good girl thus far. The only time she really fusses is when she’s hungry or the Worm is trying to separate her feet from her ankles. That’s why she has spent a lot of time in the crib, in the car seat, and in the baby sling (which saved us from having to find a coconut tree to lean her against). Which proves my hypothesis – babies with flat heads are the sweetest ones. Why? Good babies are allowed to just be. They don’t need to be held, carried, rocked, bounced, jostled, swinged, etc. They hang out. Which means that they spend more time sitting or laying down in one position than the persnickety babies that need constant attention, changing scenery, etc. By not being held as much, the happy baby heads eventually conform to the shape of the surface they come in contact with, which is usually flat. In Some Cultures, a Flat Spot is a Sign of Beautifulness!